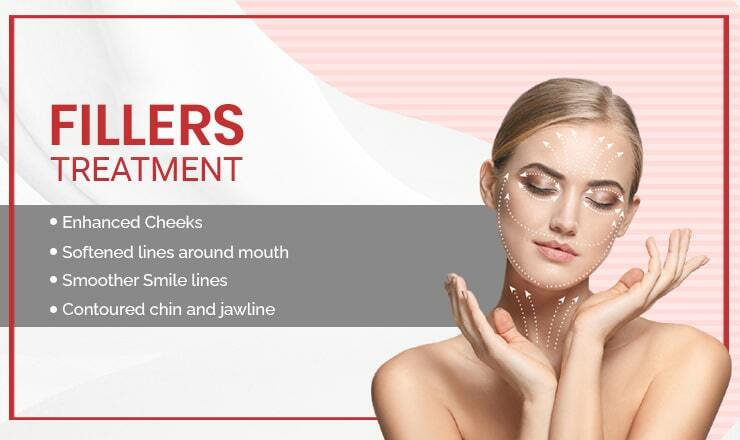 Dermal fillers treatment in Delhi are safe and fast picking up treatment in the best clinic for filler treatment in South Delhi (Defence Colony) and Delhi NCR at DermaClinix with minimum cost. Dermal fillers are basically materials used to correct scarring, wrinkles, lip augmentation, cheek augmentation and other depressions present in the skin. Fillers injections are injected into the skin to increase volume and flatten wrinkles and folds. It is an extremely gratifying experience for clients who want to look young as it can give immediate correction of wrinkles and folds. Nowadays, Hyaluronic acid (Restylane, Juvederm) and Calcium hydroxylapatite (Radiesse) are most popular filler injectables since their effect can last for six to nine months, or even longer. With our Fillers treatment, we re-juvenate your face, giving it the right shape and volume. We strive to restore the shape of the face that might have lost due to wrinkles and other signs of ageing. The fillers are usually provided to the patients in the lips, cheeks or chin so as to make their face look healthy and beautiful. In a fillers treatment, the filler is injected in the targeted skin i.e face, lip, cheek and under eye under the effect of a local anesthesia. It usually takes nearly 15 minutes for a single session of a fillers treatment at our clinic, DermaClinix, South Delhi. One of the effects of ageing is the downward sag of the midface leading to hollowing of cheeks and formation of tear trough below eyes. Now with the use of long lasting (~2 years) and more viscous fillers (JUVIDERM VOLUMA etc.) cheek augmentation can be achieved in minutes with no pain at all. These lines and creases run from the side of the nose to the corner of the mouth, and are the result of the loss of facial volume and skin elasticity as we age. They can make you look older, tired, or unhappy – even though you feel young and vibrant. Fortunately, treatment with Filler can replenish youthful volume and stimulate collagen production in this area, minimizing the appearance of those pesky facial wrinkles and folds that mask our smiles. Best of all, results are clinically proven to last a year or more in many patients after the use of hyaluronic acid fillers. These lines that run downward from the corners of the mouth can make you look like you're frowning, even when you're not. They start out as fine lines, but can turn into deeper creases as we age and lose facial volume. Filler can immediately restore lost volume and stimulate the production of your own natural collagen.